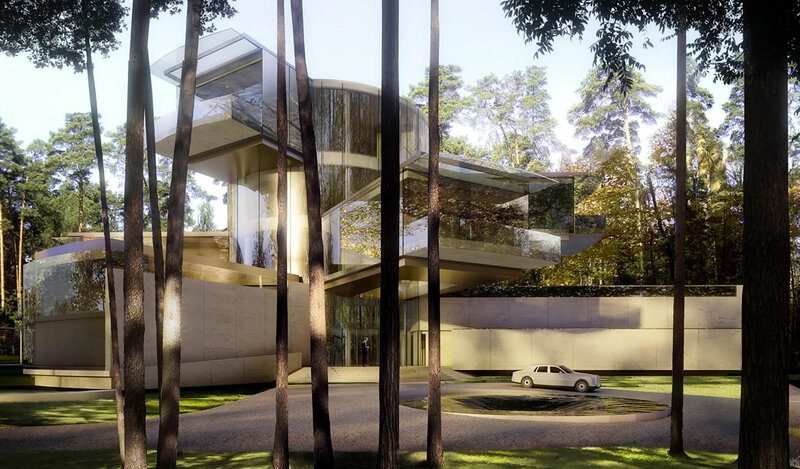 Set in woodlands 30 miles out of Moscow, Nick Eldridge’s design for a country house of 80,000 square feet responds to its setting with a spiralling tower of cantilevered spaces extending out into the treetops. The functional requirements of a house of this size are highly complex yet the resultant form is simple and rational. Both public and private spaces are accessed from a vertical rotunda through which all vertical circulation and building services are threaded between a substantial basement for car parking and plant accommodation and the fourth storey. At ground level a circular covered walkway divides the formal garden landscape and terraces from the surrounding natural landscape of the woodland. The project was exhibited at the Royal Academy Summer Exhibition and was also the subject of an article on tailor-made houses written by Nick Eldridge for the RIBA Journal in 2011 coinciding with the publication of houses shortlisted for the Manser Medal.